I would like to announce a new game I’m working on. 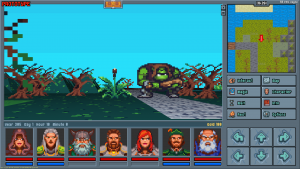 It’s a classic, old-school, party-based RPG for PC. 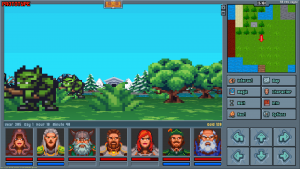 1) Classic, 90 degree rotation, FPP, turn-based, tile movement RPG. 2) Party-based (7 party members assembled upon start). 3) Open world with a big overworld to explore. 4) Fast paced combat. Quick travel. Easy inventory management. No grind. 5) Light, fairy tale like fantasy, epic story about heroes on a noble quest. 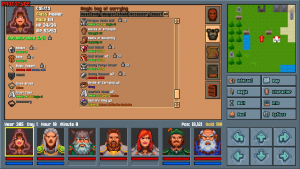 Overall, the mechanics are pretty traditional and straightforward with modern additions like equipment encumbrance system. Storyline is a fairy tale, mythical heroic fantasy. You are the good guys on a quest to fight the forces of evil (no moral choices). The world is non linear, with very few locked areas. You basically can go anywhere and do things in different order. In addition you can choose a different set of quests to finish the game (but those are not mutually exclusive, so you can finish all quests if you like). It’s more like a world driven than a story driven. The priority was to make the world feel alive and let you explore it as you wish than follow a linear list of quests. The game is planned to be released around 2018 – 2019. This entry was posted in Legends of Amberland, New Version on July 31, 2018 by Chris.